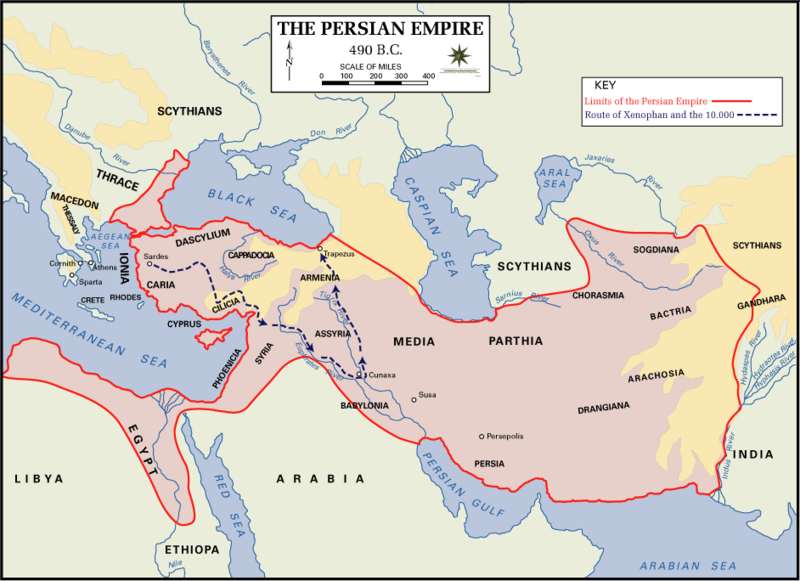 The first Persian Empire took control of the Middle East after the fall of the Babylonian Empire. It is also called the Achaemenid Empire. The empire was founded by Cyrus the Great. Cyrus first conquered the Median Empire in 550 BC and then went on to conquer the Lydians and the Babylonians. Under later kings, the empire would grow to where it ruled Mesopotamia, Egypt, Israel, and Turkey. Its borders would eventually stretch over 3,000 miles from east to west making it the largest empire on Earth at the time. Under Cyrus the Great, the Persians allowed the peoples they conquered to continue their lives and cultures. They could keep their customs and religion as long as they paid their taxes and obeyed the Persian rulers. This was different from how earlier conquerors such as the Assyrians had ruled. In order to maintain control of the large empire, each area had a ruler called a satrap. The satrap was like a governor of the area. He enforced the king's laws and taxes. There were around 20 to 30 satraps in the empire. The empire was connected by many roads and a postal system. The most famous road was the Royal Road built by King Darius the Great. This road stretched around 1,700 miles all the way from Sardis in Turkey to Suza in Elam. Although each culture was allowed to keep their own religion, the Persians followed the teaching of the prophet Zoroaster. This religion was called Zoroastrianism and believed in one main god called Ahura Mazda. Under King Darius the Persians wanted to conquer the Greeks who he felt were causing rebellions within his empire. In 490 BC Darius attacked Greece. He captured some Greek city-states, but when he attempted to take the city of Athens, he was soundly defeated by the Athenians at the Battle of Marathon. In 480 BC Darius' son, Xerxes I, attempted to finish what his father started and conquer all of Greece. He amassed a great army of hundreds of thousands of warriors. This was one of the largest armies assembled during ancient times. He initially won the Battle of Thermopylae against a much smaller army from Sparta. However, the Greek fleet defeated his navy at the Battle of Salamis and he was eventually forced to retreat. 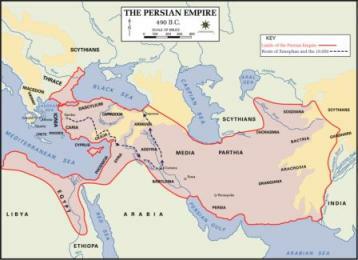 The Persian Empire was conquered by the Greeks led by Alexander the Great. Starting in the year 334 BC, Alexander the Great conquered the Persian Empire from Egypt all the way to the borders of India. The name "Persian" comes from the people's original tribal name Parsua. This was also the name they gave the land they originally settled which was bounded by the Tigris River to the west and the Persian Gulf to the south. The longest reigning Persian King was Artaxerxes II who ruled 45 years from 404-358 BC. His reign was a time of peace and prosperity for the empire. The Persian culture held the truth in high esteem. Telling a lie was one of the most disgraceful things a person could do. The capital of the empire was the great city of Persepolis. This name is Greek for "Persian City". After Cyrus the Great conquered Babylon, he allowed the Jewish people to return to Israel and to rebuild their temple at Jerusalem.